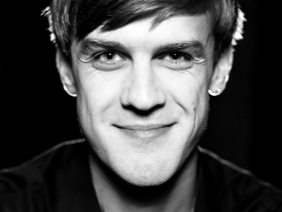 Ignas Mažvila was born in musician family in 1985 in Vilnius, learned in National Mikalojus-Konstantinas-Čiurlionis-School ir Arts with Alfonsas Ančerevičius. Ignas was studying in the Malmö Academy of Music with prof. Asger Svendsen, in the UDK Berlin with prof. Eckart Hübner and in the MUHO Mannheim with prof. Ole Kristian Dahl. Ignas Mažvila is the winner of three National Woodwind Competitions in Lithuania in 1999, 2001 and 2003. In the International Chamber Music Competition in Klaipeda he won diploma and Special Prize for best modern music performing. 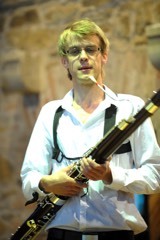 In 2004 he won 1st prize in Kiev, Ukraine in the Bassoon Competition "XXIst Century Art". 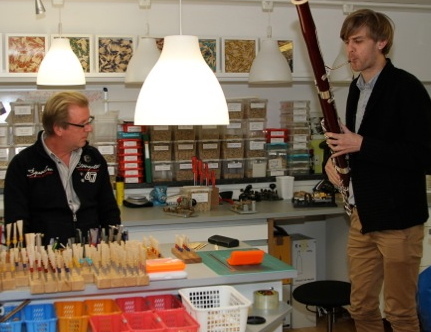 In 2011 with his woodwind quintet “Mazvila Winds” he won 2nd prize in Danish National P2 Chamber Music Competition. In 2003, 2004 and 2005 he had Masterclasses with prof. Asger Svendsen, in 2007 with prof. Klaus Thunemann, in 2008 with prof. Eckart Hübner and prof. Georg Klütsch and 2011 with prof. Dag Jensen. As Guest Principal bassoon he had longer engagements with Rotterdam Philharmonic Orchestra, Singapore Symphony Orchestra, Kremerata Baltica. As well played with New European Ensemble, EU Youth Orchestra, Gustav Mahler Jugendorchester, Gothenburg Symphony Orchestra, Aarhus Symphony Orchestra, Danish National Symphony Orchestra etc. As a soloist with orchestra Ignas performed few of the Vivaldis concertos, Mozart and Rossini concertos. Being an appreciated chamber musician, his name appears in such festivals like Lockenhaus in Austria, playing in chamber ensembles like “Black Diamond”, “The Royal Danish Octet”, playing with artists like Gidon Kremer, Alessandro Carbonare, Alois Posch, Zora Slokar, Mate Bekavac, Dora Seres etc. Like any other bassoon player I used to have a lot of trouble with my reeds. 3 years ago I tried 'Halvorsen reeds' made by Hans Wisse for the first time and since then I use only these reeds. They work perfectly whenever I play as a soloist, chamber musician, or in symphony or chamber orchestras. I especially like the color of the sound in all registers and every dynamic. This too helps me a lot when I play with Adam Fischer - a great conductor demanding extreme pianissimos and big fortissimos. I often find myself recommending Hans Wisses reeds to my bassoon colleagues. If you really use the full capacity of the air and full body resistance these reeds are exactly the ones you need.